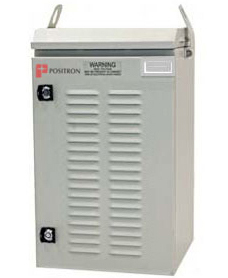 Positron’s Active Integrated Regenerator (AIR) family of Ethernet and DS3 over Copper products extend the rate and reach of Positron’s AK355 (Ethernet and DS3) and AK355E (Ethernet) products from 18 Kft/ 5.5 Km* to 50 Kft/ 15.2 Km* and beyond. The AIR regenerators are line-powered active mid-span systems in hardened enclosures that can be deployed indoor or in outside plants. The AK355RPTRC(E) active regenerator is a 16-pair system that works in conjunction with AK355CPS(E) and AK355RP(E) units delivering 100 Mbps asymmetric or 50 Mbps symmetric at distances up to 26 Kft/ 7.9Km* for Ethernet application. The AK355RPTRC is designed to maximize downstream performance for asymmetrical operation such as DSLAM backhaul with flexibility to set the upstream bandwidth to fit the Ethernet application. The AK355RPTRC regenerator also supports fractional or clear channel DS3 applications. The AK355RPT(E) active regenerator is a 16-pair system that works in conjunction with AK355CP(E) and AK355R(E) units delivering Ethernet or DS3 services supporting both symmetric and asymmetric bandwidths and extending the reach of the AK355 in Carrier Ethernet or DS3 mode. The AK355RPT(E) is best deployed for symmetrical links such as 50 Mbps symmetric Ethernet service or clear channel DS3 links where both spans feeding into the AK355RPT(E) are configured for symmetrical operation. The AK355RPTRC(E) and AK355RPT(E) active regenerator support setups with more than two span for ultra-long reach applications and are ideal in network deployment scenarios with reverse ADSL. Both systems do not require to have a local power in the mid-span cabinet for a two span circuit. Local power is required for circuits with more than two spans.